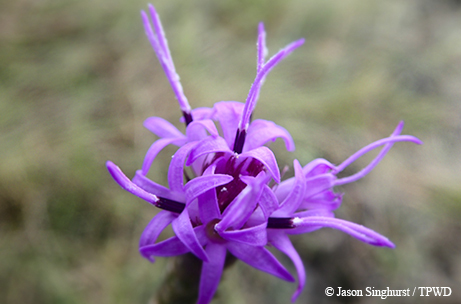 Bracted blazing star illuminates coastal prairies each fall. Powderhorn Ranch in Calhoun County will become a state park and wildlife management area open to the public in a few years. During a recent biological survey of the tract, Baylor University’s Walter Holmes and Jeff Mink and I were pleased to encounter a large population of bracted blazing star (Liatris bracteata) sure to delight those future visitors. Bracted blazing star is a globally rare Texas endemic (found nowhere else but Texas) plant that is distributed along the upper and central coast from Houston south to Rockport. This vibrant member of the sunflower family occurs in coastal prairie grasslands of various types. The perennial’s flowers are found deep in the center — bright purple fluffy disks that resemble “blazing stars.” What may appear to be long, widely spaced “petals” surrounding the flower are actually “bracts,” or specialized leaves (in this case, colored like the flower). Bracted blazing star flowers from late September through November and is especially valuable to native bees, which assist with pollination. Bracted blazing star is a great coastal prairie native that has been recently used in prairie restoration projects from rescued populations being affected by development. The Houston Chapter of the Native Prairies Association of Texas is reproducing this rare plant from rescued sites and conducts fall field trips to natural populations. TPWD’s Wildlife Diversity Program works with Texans to conserve rare plant and animal species and areas with high conservation value. We’d like to learn more about populations of bracted blazing star, especially those not yet documented. Together, we can work toward conserving this rare native wildflower that vividly illuminates coastal prairies each fall.